The 2012 Africa Cup of Nations could be thrown into chaos after Namibia pledged to take their protest over Burkina Faso's involvement to the Court of Arbitration for Sport. On Friday, the Confederation of African Football dismissed Namibia's appeal over the eligibilty of Burkina Faso's Herve Zengue on a technicality. But the Namibians maintain that Caf is ignoring one of its own rulings, which states that any team fielding a 'non-qualified player' should still lose a match regardless of any protest. The Namibian FA has told the BBC it will first appeal to Caf and, if necessary, the Court of Arbitration for Sport afterwards. Article 36.12 states that a team which allows a 'non-qualified or a suspended player to take part in group matches shall lose the match by penalty (3-0), even in the absence of protests/reservations'. Cameroon-born Zengue appeared in two matches for Burkina Faso during the 2012 Nations Cup qualifiers, both of which resulted in victories over Namibia. However, had Namibia been awarded the points - since they believe Zengue to be ineligible to play for Burkina Faso since he has yet to receive Fifa clearance - then the Brave Warriors would have qualified for the finals. This is because the six points from two technical 3-0 victories would have seen them finish Group F with an unsurpassed nine points - five more than the Burkinabes' revised total. 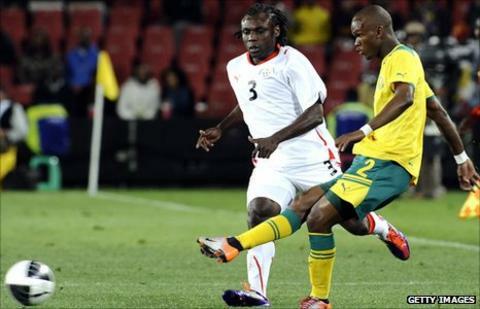 "For us, it is very clear that the reason it took so long to arrive at what appears to be a simple decision is because people were looking for technicalities," Barry Rukoro, the General Secretary of the Namibian FA, told BBC Sport. "Because you will note that the merits of the case were never addressed." When Caf dismissed the case, it did so on the grounds that Namibia had failed to fulfil Article 37.1 of its Nations Cup rules. '[A protest against the qualification of a player] must be preceded by a nominal and motivated protest formulated before the match on the proper form of the match by the captain of the protesting team and communicated to the captain of the opposing team who will countersign it,' the rules state. Rukoro stresses that his organisation did indeed follow the ruling. "We approached the match commissioner before the match, who directed us to the match referee. Before kick-off, the two captains were called, they signed the protest and the documents were taken by the referee," he explained. "If the referee did not submit those documents as part of his document, it should not be our problem as we are not the ones appointing the referee." "The provisions of Article 37.1 evolved right in front of thousands of Namibians sitting in the pavilion waiting for the match to happen so it is very unfair for someone in Cairo to say that did not happen." While freely admitting that Namibia is pursuing its case partly to appear at next January's Nations Cup, Rukoro also says his FA is fighting on behalf of Africa's smaller associations. "It is not only a case of us wanting to play at the Nations Cup but a case that this thing is happening all over the continent," he said. "I think that some of our smaller associations are being disadvantaged by these kinds of actions." "We are going to appeal in terms of the regulations to Caf but even if that appeal does not succeed, because we believe we have a very good case, we will go all the way to the Court of Arbitration for Sport. "Some people presume that because we are a small national association, we can be tramped on and we will do nothing. I think it is high time that we spent some of the resources that we would have spent on development on enforcing people to come clean." "I would have listened to the decision more sympathetically had Caf pronounced themselves on the merits of the case - but they are quiet on whether Zengue qualifies or not. "They want to knock us out on a technicality - as is normally done with smaller national associations - but if we want to play with the big guys, we have to act like some of them." The Court of Arbitration for Sport, which is based in the Swiss city Lausanne, is global sport's highest ruling body. On Saturday, Burkina Faso were drawn in Group B for the 2012 finals, alongside Ivory Coast, Sudan and Angola.